On the Peninsula of the San Francisco Bay Area, there are several popular American brunch restaurants that people frequently visit. From Nini in San Mateo, Millbrae Pancake House in Millbrae, Crepevine in Burlingame, and Stacks in Burlingame. For the most part, these restaurants all serve variations on the same items: omlettes, pancakes, waffles, eggs, and coffee. 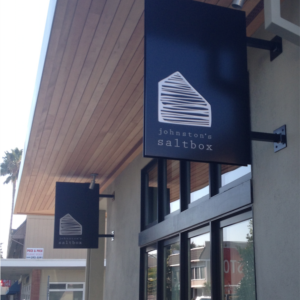 But now, I've come across a restaurant that is doing things differently: Johnston's Saltbox in San Carlos. Johnston's Saltbox is a small, but very efficient operation. Their operation is by far the most unique operation I've seen in the suburbs of the Bay Area. The building itself is very contemporary and well designed. The interior is decked out in wood styling. Large floor to roof windows that opened to the patio allowed natural light to flood the restaurant. Outside, the patio is well covered by heat lamps. Looking up, there are strings of light. The walls of the outdoor patio are seeded with vined plants. Finally, the most unique feature was the rooftop garden where herbs, tomatoes, artichoke, and other variety of vegetables are grown. The other side of the roof has a beehive that aids in pollination of their vegetable garden, but also for the honey. The only downside is the seating is quite limited. As the restaurant gets more popular, I can imagine a line queuing up. Other than that, the owners of Johnston's Saltbox did an amazing job to create a dining environment of one in Napa County, not San Carlos! On top of the fantastic decor, the food we were served was amazing. Johnston's Saltbox has a relatively small menu, but the menu is printed and dated daily. Though the serving size of the dish isn't as generous when compared to other local breakfast spots, the ingredients had the impression of being higher quality, given their website claims to be a family owned restaurant that cooks from scratch with seasonal ingredients that are locally sourced. From the time I dined for brunch to the time I wrote this review, the menu has had a change of taste. But the same number of dishes are available. On average, there are 5-6 dishes for lunch, dinner, and brunch (Sat and Sun). My visit was randomly chosen the night before, for a party of six, to celebrate a birthday. Lucky for us, despite the fact Johnston's Saltbox did not take reservations and allows up to a party of six, we only had to wait about ten minutes before we got seated. While waiting, we had the option to order drinks from the bar while we wait for the table. We decided to wait out front for the rest of our party to arrive. Our waitress was enthusiastic the entire time. At one point, the owner came by to see how our meal was coming along. We had a great conversation, and at the end of our meal got a tour of the amazing rooftop garden. After my brunch experience and the tour of the rooftop garden, I am looking forward to the chance to give Johnston's Saltbox a chance for dinner. The outdoor patio has heat lamps and string lights that looks like lots of fun. Read the story of this restaurant at http://johnstonsaltbox.com/.